Winning on it’s debut, the Taylormade TP5 cemented its position in the market early. With John Rahm steering the TP5 to Victory at the 2016 Farmers Insurance Open - his first win on the PGA Tour. 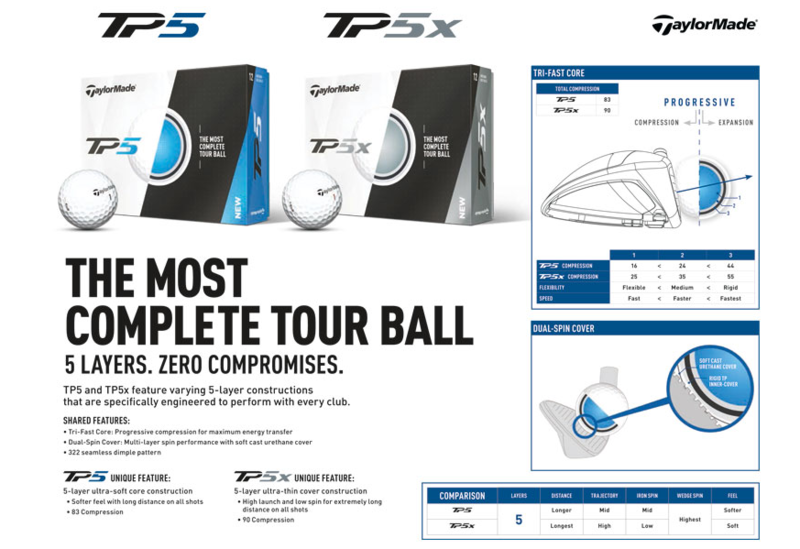 It’s been over seven years since the launch of Taylormade’s Penta TP Golf Balls, which was their first five-piece design. The 2017 model also features this 5-piece structure. However, the design has been improved, with each layer holding specific technologies to enhance the characteristics of the golf ball. The Tri-Fast Core includes three of the five layers and effects the compression, energy transfer and ball speed on full shots. The Dual-Spin Cover, the remaining two outer shells, are there to improve control and spin around the greens. When combined, these shells allow for progressive spin rates throughout the bag.